Discover the world of fascinating 3D Technology Now! With powerful 3D Video Player you can watch any format video in HQ 3D on the fly. Just activate the 3D button on the interface and enjoy! 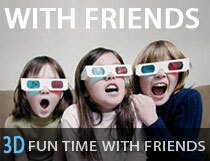 Watch any video in 3D anywhere and whenever you like! 3D Video Converter enables you to transform “flat” 2D video to HQ 3D for further successful playback in any multimedia player or hardware device of your choice. 18.05.2012 3D without glasses - the future of 3D technology? Really good, the time moved so quickly I didn't even notice when 3D conversion finished. And the quality of output 3D video was really fine, all thanks to 3D Video Converter. It's awesome! Didn't know it's possible to watch my videos in 3D, cause I thought only graphic designers can do that in Adobe. But actually I can do that with 3D Video Converter - to convert 2D flat video to 3D. It's not messy and very simple-to-use program. Finally have my own 3D theater at home without having to buy an expensive 3D TV plasma. All thanks to 3D Video Player. It's the program I was looking for. 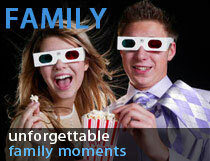 For 3D fans like me 3D Video Converter is a must to experience 3D movie at home. Just a quick note to say thanks for your player. Got 3D glasses for my birthday but didn't know what to do with them except going to IMAX. But now with your player I watch literally everything in 3D, lol. ...smooth 3D playback - that's what I needed. Fortunately I got it. I'm not a techy person, you know. So I didn't expect it'll be so easy to install and use this player. Now kids are happy watching their favorite cartoons in 3D. Many thanks! – Kate Padstow, Cornwall, Ontario. Captivating world of 3D video becomes closer than ever - with 3D Video Player and 3D Converter you will be able to create your own 3D cinema straight at home. Both of these powerful programs are able to transform your common movie viewing into an unforgettable exciting experience, enabling you to watch any video with staggering 3D effect. 3D Player is a unique media player that lets you enjoy any kind of movies in 3D with just 1 click. It transforms "flat" video into a stereoscopic anaglyph picture in real-time mode, giving you a possibility to watch ordinary 2D video in 3D straight away, thus saving your time. 3D Player will be a great solution for everyone who wants to watch any video from his or her movie collection in 3D format at sight. In its turn, 3D Converter is a potent tool that can convert any file from your video library to 3D format for further playback on any video device. It transforms original 2D stream into a three-dimensional anaglyph and transcodes it into a file compatible with regular software players and hardware video devices. If you don't want to be bound to your computer to enjoy your favorite movies in 3D, you can use 3D Converter and play output files back on your TV or any portable gadget of your choice. 3D Converter provides extremely high conversion speed and ensures perfect quality of the output videos in order to save your time and provide the best possible 3D viewing experience. With the help of this powerful software you can enjoy all movies you want in 3D format with no limitations wherever and whenever you want. Now you can enjoy any video from your collection, be it the latest blockbuster or your home video, with fascinating 3D effect - all you need is to convert movie to 3D with the help of 3D Converter. This 3d conversion tool supports all popular video formats, enabling you to convert to 3D any video file regardless of its initial format. It will convert any video you want quickly and easily as it has intuitive interface and is extremely easy to use. 3D videos give you a chance to experience fantastic viewing, completely different from watching common 2D films. You just need to select a movie you want to watch, convert to 3D, put on special red-cyan glasses, and enjoy realistic three-dimensional image on the screen of any video device you have chosen. Both 3D Player and 3D Converter will provide you with perfect playback quality, and breathtaking 3D effect will make you feel yourself the direct participant of the events taking place on the screen. Feel free to convert to 3D, create your own 3D movies, and enjoy them with 3D Player and 3D Converter.